I came across the brand ASTR while shopping at Nordstrom a few weeks ago. I usually roam around like a crazy person, but this time I found myself parked at the ASTR rack ogling over every piece. 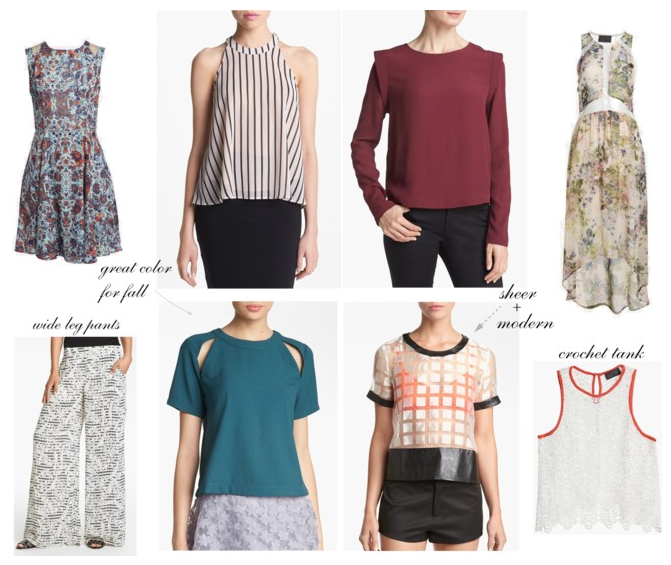 I love the modern shapes of the tops and the colors have me excited for fall. I especially love the cut-outs on the teal tee and the structured shoulder on the wine colored blouse. Speaking of teal, did you see the spread on this color in the August issue of In Style? Page 128 to be exact. Teal is ON for fall. Not only are these clothes desirable because of their design, their price point is crazy good. Most of the pieces run between $50-$80 and a few of them are currently on sale. I am definitely planning on snagging the teal Cutout Zip Back Tee ($56!) and the Mesh Mixed Print Skater Dress ($50!). tip: If you want to have the option of tucking in the teal cut-out tee into jeans or trousers, go up a size. It does fit true to size, but I like the top a little longer so its a bit more versatile. I'm planning on going up one size. What do you think about ASTR? Would you wear their clothes? Shop My Favorite ASTR pieces + More. Love the crochet top and the maxi dress. Can't believe the prices either!! Thank you for introducing this brand! They have some majorly awesome pieces! gorgeous stuff, thanks for sharing! i hadn't heard of the line.